For the last 20 years there has been a growing interest in the geosciences for topics related to geoheritage: geoconservation, geotourism and geoparks. 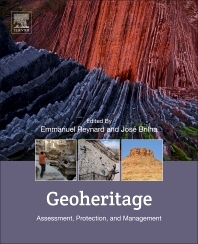 Geoheritage: Assessment, Protection, and Management is the first and only reference book to cover these main topics as well as the relationship of geoheritage to other subjects such as landscapes, conservation, and tourism. The book also includes methodologies for assessment, mapping, and visualisation, along with case studies and colour images of some of the most important global geosites. This book is an essential resource for geoscientists, park and geopark managers, tourism and regional planning managers, as well as university students interested in geoheritage, geosites, geomorphosites, geoconservation, and geotourism. It also includes critical information on UNESCO’s Global Geoparks, World Heritage and Biosphere Reserve sites, national parks and protected areas in general, land-use planning and nature conservation policies, and in the general contribution of geodiversity for sustainable development. 15. Geoheritage: Getting the Message Across. What Message and to Whom? Emmanuel Reynard is a geographer and Professor of Physical Geography at the University of Lausanne (Switzerland). He chaired the working group on Geomorphosites of the International Association of Geomorphologists (IAG) from 2001 to 2013, and has been president of the Working Group on Geosites of the Swiss Academy of Sciences since 2006. He is a member of the Executive Committee of IAG and Honorary Professor of the University of Bucharest (Romania). He develops research on geomorphological heritage and geotourism, water management in mountain areas, and geohistorical studies of landscape changes. José Brilha is a geologist and Professor at the University of Minho (Portugal). He is President of ProGEO (The European Association for the Conservation of the Geological Heritage), member of the UNESCO Global Geopark Evaluation Team and the IUCN World Commission on Protected Areas and its Geoheritage Specialist Group. He was founder and Editor-in-Chief of the journal Geoheritage, member of the Geoheritage Task Group of IUGS, of the Portuguese Committee for IGCP and of the Portuguese Geoparks Forum. Currently, he develops applied research on geodiversity, geoconservation, and geoparks. "Geohiritage" with Professor José Brilha began many years ago when he taught us, future geology teachers, with passion. I've been a better teacher for this 17 years because of him. My middle and high school students are aware of Geoheritage, and those resources will still be availabe for them and the next generations because of Professor Brilha and his colleagues work.